Houses & Homes VA: Thanksgiving: To Fry or not to Fry, that IS the Question! Thanksgiving: To Fry or not to Fry, that IS the Question! OK, I know you think that you have more important things to do but frankly, I don't think so. What could possibly be a higher priority than planning your Thanksgiving meal in advance? More specifically, will you do the usual 3 - 4 hour "roast a turkey in the oven" ritual or do you dare to be different? To go where no man, I mean person has gone before? I consider myself to be a bit adventurous (at times) and I am not afraid of taking a chance. Oh sure, I'll be having the usual stuffing, mashed potatoes and cranberry sauce (I'm not that daring) but what about the bird? Do I have what it takes to try it fried this year instead? Do I plunge blindly into the abyss breaking all the rules, discovering new worlds, leaping head first into a hitherto unknown dimension of non-baked euphoria? Well, I'm not sure. OK, I admit it, I’m scared! I want to try it so badly I can almost taste it, but what about smelling that slowly baking bird in the oven for hours and hours? Do I still get to watch and wait for that little plastic “thingy” to pop up assuring me that this golden brown delight is truly done, ready for consumption by all of the other “tryptophan junkies” that have gathered within my humble abode in quiet anticipation? I just don’t know if I can do it but one thing is for certain, NOBODY is taking away my pumpkin pie ala mode for desert, NOBODY. If you’re considering throwing caution to the wind this year and frying your turkey for the first time maybe this will help you out! The following is a recipe that I found on the Food Network and people are raving about how great it is. As for me? I just don’t know if I have the power captain! Wash bird inside and out, and allow to drain. Rub turkey all over with House Seasoning. Coat turkey with dry rub. Allow the bird to sit until it reaches room temperature. 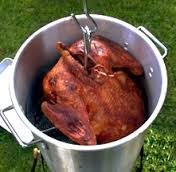 Heat peanut oil in a turkey fryer or a very, very large stockpot to 350 degrees F. Lower turkey into hot oil, very carefully, making sure it is fully submerged. Fry turkey for 3 minutes per pound plus 5 minutes per bird. Remove turkey from oil and drain on paper towels.